HP's surprising partnership with hip-hop producer Dr Dre has bumped it up in the cool stakes, and brought some much-needed quality to the beleaguered world of laptop speakers. While HP's mid-range multimedia DV7-6103ea isn't quite as sleek as the company's Envy range, it has pilfered the same design finesse and also comes with the superior Beats Audio experience. Taking a leaf from the Envy range, this laptop is solidly built and looks great. The burnished gunmetal finish gives a great streaky effect, adorning the top of the lid and surrounding the chiclet keyboard. Shame it's only plastic but, at 3kg, it feels sturdy enough. In terms of portability, it's never gong to be light on a 17.3-inch chassis, but at 416 x 275 x 36mm, the DV7-6103ea is svelte. As we expected, the laptop produces more powerful sound than most other laptops, though it's never going to beat the throw of external speakers. Of course, most laptop users sit near their hardware and will enjoy listening to music as they work, while movies played with a rich sonic feed. The Blu-ray player sits on the right hand side and ports are standard fare, with two fast USB 3.0 ports, two standard USB 2.0s, a VGA out and a HDMI out so you can connect to other HD devices. There's even a multi-card reader and internal USB remote. The low lighting in The Dark Knight meant we lost a lot of detail in natural light, but the stunning details with the lights off impressed - even though it's not full HD. 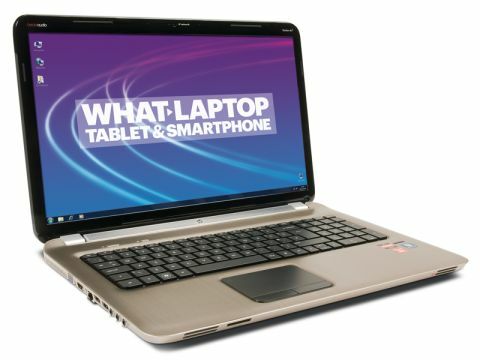 The DV7-6103ea has AMD's Quad-Core A6-3410MX fusion GPU and CPU, which is great mobile tech for enhancing battery life. With a generous 6GB of memory, we had no lag or stutter on video playback or when multi-tasking. The latest games will struggle, however. There's an enormous 1.5TB of storage for all of your applications and media. If you're looking for a smart new multimedia machine for movies and music, the DV7-6103ea is a great choice that won't break the bank.